Just putting the finishing touches to our on-line LiveTwice store today – all very exciting and slightly nerve-wracking. The last on-line store I helped put together was the Liz Earle Beauty Co. website and that was many years ago…. 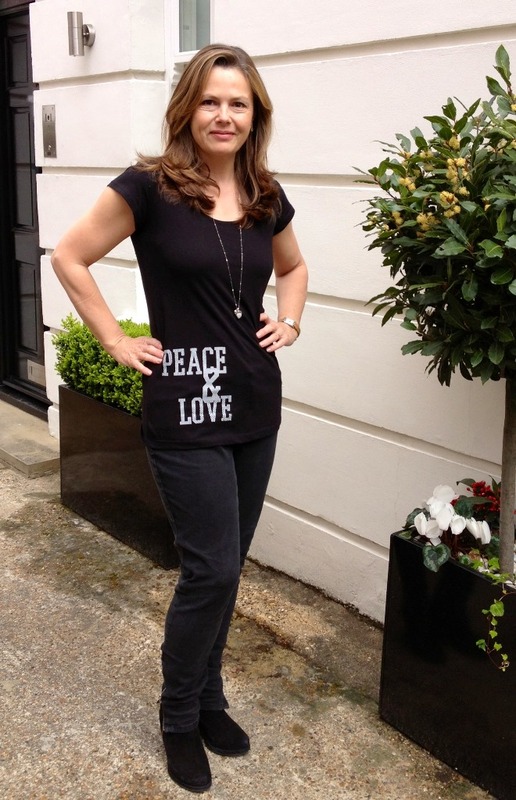 We’ve just received the first of our exclusive ‘positive statement’ clothing designs – this is me this morning having just put on our new PEACE & LOVE slouchy T-shirt! I love comfy, easy-to-wear T-shirts but all too often find they don’t look that great on, so… I made sure this one is cut extra long and has a flattering scooped neckline. Available in classic black with distressed ‘vintage’ style lettering, we produced this for LiveTwice in association with the brilliant I-61 designs, founded by the inspirational Deborah Paul. Watch this space for more from I-61 – we’re very thrilled to be collaborating with them. Each one of our co-designs carries their neckline label and signature stitched cross on the right shoulder. It goes without saying that we’ve also used the highest quality organic cotton, super-soft yet lightweight for summer. The cotton we’re using is actually labelled Earth Positive as it is climate neutral, manufactured solely using renewable green energy from wind and solar power. Each T-shirt also carries the Soil Association gold-standard organic cotton certification. At just £19.50 we think we’ve produced a wearable winner – I know mine will be a very versatile and useful piece of clothing that will take me from the gym, through to weekend-wear and holidays. I hope you love our new range as much as we all do – watch this space for more designs coming soon. And don’t forget – 100% of ALL profits from each sale go directly to help our projects. It’s a win-win for all!